On April 15, the Fight for $15 & Fairness officially launched across Ontario, with over 15 actions in 10 cities! Actions took place in Toronto, London, Peterborough, Hamilton, Ottawa, North Bay, Sudbury, Thunder Bay, and Oshawa. The Fight for $15 & Fairness followed with an energetic rally at the Ministry of Labour. WAC members came out to help organize the rally, handing out flyers and $15 & Fairness chocolate loonies, and getting 600 signatures on a petition demanding decent work to be sent to the Minister of Labour. The rally heard from inspiring speakers, including Sid Ryan from the OFL; David Anderson, a young worker with UNITE-HERE; Deb Henry, a grocery store clerk and UNIFOR member; Alastair Woods from the Canadian Federation of Students-Ontario; Myles Magner from OPSEU; Dr. Jim Deutsch from Health Providers Against Poverty (HPAP); and Marta Jaramillo, a member of the Workers’ Action Centre. Mohammad Ali got the crowd going with rhymes about precarious work, and the rally ended with a delegation going in to the Ministry of Labour to deliver a clock to Minister Flynn – saying “It’s Time For Decent Work”. Check-in clerks, security guards, grounds crew, flight attendants, and porters held a lively demonstration in front of Terminal 1 Departures. The rally heard speeches from the Airport Workers’ Council representative, the Toronto and York Region Labour Council, NDP MP Peggy Nash, and a member of the Workers’ Action Centre. As we marched from one end of the Terminal to the other, we made stops along the way to hear from workers about job insecurity and contracting out, low wages, and lack of benefits. Their message was loud and clear: airport workers take care of people, but the GTAA does not take care of workers. WAC was proud to be a part of such an amazing day of action! Around the province, organizers and members of the Fight for $15 & Fairness organized rallies, solidarity actions, and community events in support of the fight for decent work. Visit the campaign website for more updates from across the province, and go to the campaign Facebook page for more photos. On the heels of a successful day of protest across the province, organizers and allies of the Fight for $15 & Fairness came together for a full day of strategizing and action planning on April 17. WAC members participated in the strategy session to help develop a plan for the campaign for the next year. Participants were very fortunate to have friends visiting from the Fight for $15 in the US, to share their insights and experience and give us first-hand report-backs from the April 15 actions in their cities. Jessica Davis, a McDonald’s worker from the Fight for $15 Chicago, and Rick Ross, from the Fight for $15 Seattle and SEIU Local 775 motivated us with their inspiring stories of organizing mass mobilizations with workers. Everyone at the meeting was very grateful that Jessica and Rick travelled so far after such a busy week to spend some time with organizers from across Ontario! Participants from our strategy meeting then went on to take part in the Ontario Common Front’s Anti-Poverty Assembly on April 17 and 18, which featured Jessica and Rick as speakers along with other progressive voices from a diversity of movements. The Assembly included roundtable discussions on how to strengthen the connections between various anti-poverty campaigns. WAC members participated in discussions about organizing for fair employment, and about the Fight for $15 & Fairness campaign, among others. 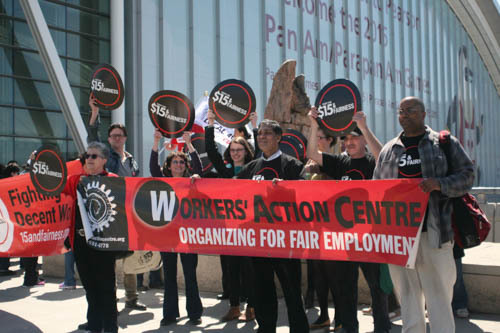 It was an action-packed week, and WAC was proud to be part of the launch the Fight for $15 & Fairness! Visit the campaign website for news and updates.